EJ Scott to Accept Visionary Award at Marathon this Sunday. 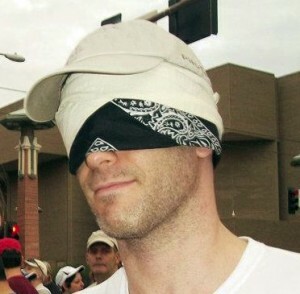 EJ Scott ran his 12 marathons in 2012 and not only that, he ran them blindfolded. Even more exciting is that he raised more than his $144,000 annual goal. He certainly did all he said he would do and more. Now, because of this amazing year and what he has done, EJ has been selected to receive the Visionary Award at the fourth annual Allstate Life InsuranceSM 13.1 Marathon® and 5K on Jan. 13. The 13.1 Marathon begins at 7 a.m. in Venice, Calif., and ends by the ocean in Playa Del Rey. The Allstate® Life Insurance 5K follows at 7:15 a.m. The Visionary Award Presented by US Road Sports was established to recognize an athlete with the Vision and foresight to change sport, in a positive way, through innovative thinking and constructive actions both within competition and in life. The disease that EJ suffers from is called Choroideremia which is a disease that has robbed him of all but 15 percent of his eyesight. It is a degenerative eye disease, which makes him very sensitive to light. 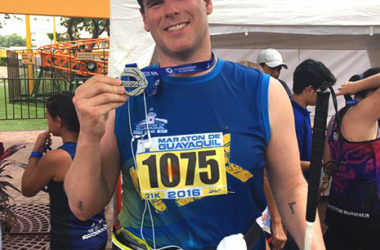 Despite this, he completed a crusade to run one marathon a month in 2012 and raised more than $90,000 for the Choroideremia Research Foundation. Scott, an actor and comedian now in his mid-30s, will run blindfolded in the Allstate® Life Insurance 5K on Jan. 13 along with his girlfriend Deborah Ann Woll, best known as Jessica Hamby on HBO’s True Blood. “E. 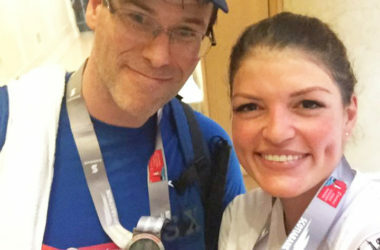 J. Scott is a true visionary in his efforts to raise awareness of his eye disease, Choroideremia, and also in his fundraising work to combat this disease,” said Greg Laird, CEO and Managing Partner of the event organizer, US Road Sports. 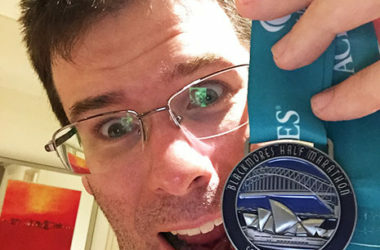 Scott created the idea of running 12 marathons in 12 months in 12 states, running all of them blindfolded, to raise research money for Choroideremia. “My biggest fear about going blind is that I won’t get to see my-yet-to-be-born or conceived children grow up and be involved with them visually,” he said. “I have two small nephews and a brother that all have the disease and that’s pretty frightening. 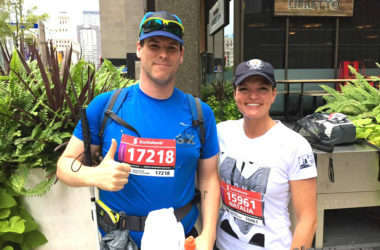 This is why I run.” Scott’s sister was diagnosed as a CHM carrier and her oldest son, Liam, tested positive in 2005; Aidan, the youngest son, has also tested positive. Registration is open for the Allstate Life InsuranceSM Los Angeles 13.1 Marathon® and 5K on Sunday, Jan. 13. More than 4,500 runners will run the streets of the South Bay at the Allstate Life InsuranceSM Los Angeles 13.1 Marathon®, starting at Rose Avenue on the Venice Boardwalk and ending on the shores of the Pacific at the end of Culver Boulevard in Playa Del Rey. Runners will celebrate finishing the event with friends and family at the Michelob Ultra Finish Line Festival. Live entertainment, food and refreshments, including the Michelob Ultra beer garden, will highlight festivities. Participants will also be able to donate their running shoes through a special partnership between Allstate and non-profit Give Your Sole (giveyoursole.org), to provide moderately-worn athletic shoes to the Los Angeles-area homeless community.